Major General George B. McClellan wasn't exactly a supreme military strategist and his unwillingness to attack General Robert E. Lee's forces as part of the Peninsula Campaign early on resulted in dragging the Civil War out longer than it maybe needed to go. 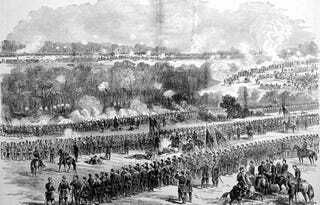 The culmination of this standoff between The Army of the Potomac and the Confederate Army was the Seven Days Battles, which included the retreat of McClellan and his superior forces. Though neither side was overwhelmingly victorious, and Lee's army suffered serious casualties, the concept of repelling the larger army encouraged the Confederates and deeply ruined morale in the north. We're not sure what battle led to this guy leaving his Ferrari in the lake for a week, but Engineerd has an idea. Trying to find a Ferrari shop to rebuild the waterlogged engine. Getting "loans" from Vito and Vinny to pay for the rebuild without having to go through his insurance. Drinking away the memory of ditching his car in the lake. Trying to remember which lake he left the car in. Waiting for his wife to leave town. She still thinks the car is in the shop. Let's hope she doesn't read Jalopnik. If she does, we can't wait for that comment.